Looks good! I wouldn't hassle over the unions..you're good to go! 2x... Very nice & clean install! Man, looks good, Yama-Bro! Great pictures, as always - makes it easy to follow what's going on! Pete, I noticed the big clear pictures from multiple angles is really handy when I look at other peoples' build threads, so I'm hoping mine will help someone out as well. Yeah, they help me out a TON! I can tell you that i have the factory five manual open AND your thread open whenever we work on the car. Thank you! Last edited by PeteMeindl; 12-20-2018 at 11:07 PM. Thanks man! That's awesome! I'm really glad to give back to the forum! Here's my fuel filter install. I shamelessly copied Papa's solution, because it's damn near perfect. Thanks Papa . 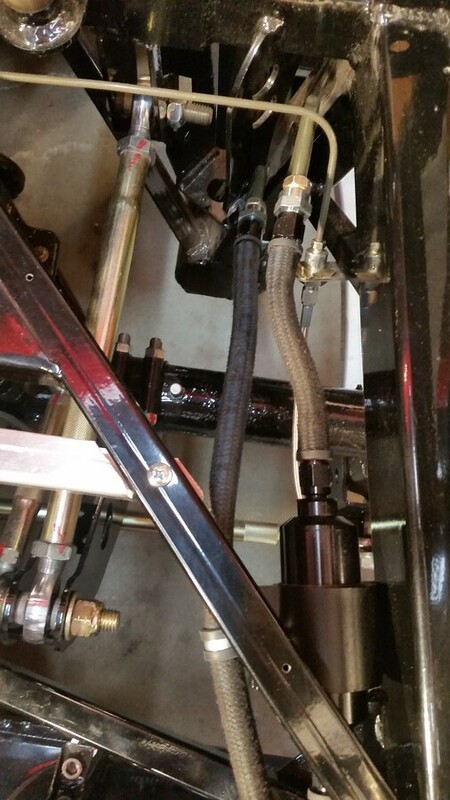 I bought a larger OD filter than Papa, so I bought a bigger sized roll bar bracket (same brand). 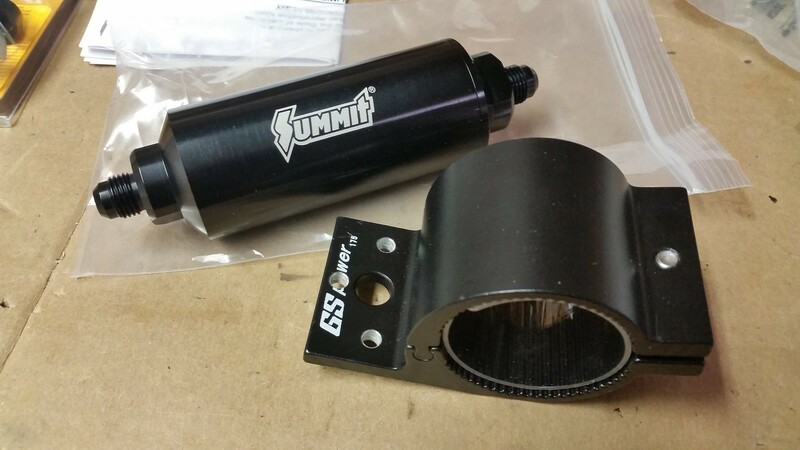 I'm using a billet Summit 10 micron filter, part number SUM-230123B, ...click here and a GS Power 1.75" roll bar bracket from Amazon...click here. The filter fits in this bracket like it was made for it. It has a nice (vinyl?) sleeve inside the bracket that holds the filter secure. Here's the bracket attached to the frame with the filter in it. Great fit. Don't forget to orient the filter for the proper direction of flow. This is a view looking down from the top. It's tough to tell in this picture, but I have the bracket mounted to the frame so that the filter sits as high in the frame as possible. Basically the flat side of the bracket that you'd normally mount to your object is facing down and the opposite side (the surface that has the words, in the pic above) is up against the frame with the round part of the bracket overhanging the side of the frame tubing. This allows the filter to be up and out of the way, but I still have easy access to the bolt and to remove the filter when needed. Last edited by Yama-Bro; 12-22-2018 at 11:13 AM. Looks great, Frank. There's no shame in using anything shared on this forum. That's what it's all about! When I read the description of the Fragola push lock hose and fittings I got the impression you can simply assemble them by hand. Well, I must be weak because it wasn't happening for me. 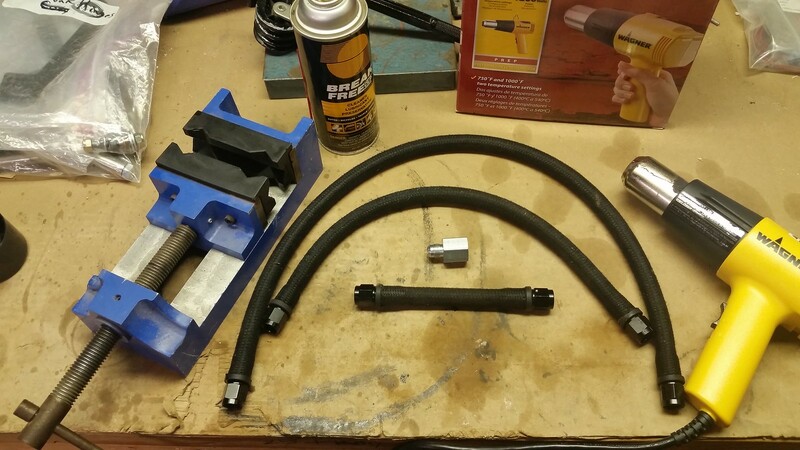 Of course, there's a $300 tool you can buy to put them together, but I didn't think it was justifiable for a few little hoses, so I decided to figure out another way to do it. I went through about three variations of homemade fixtures before I ended up with this setup. 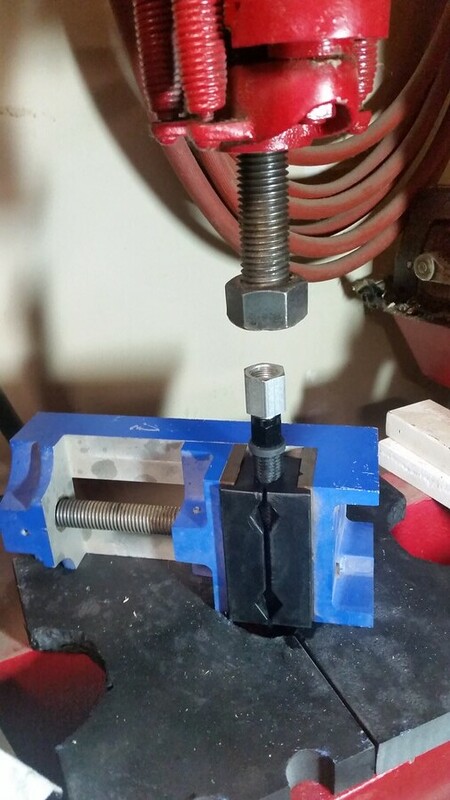 I also used a spray lube, some heat, and my hydraulic press and they went together without a complaint. Here are the completed hoses and the stuff I used to assemble them. I used an extra adaptor fitting that I had laying around to keep from scratching the one that was going on the hose. 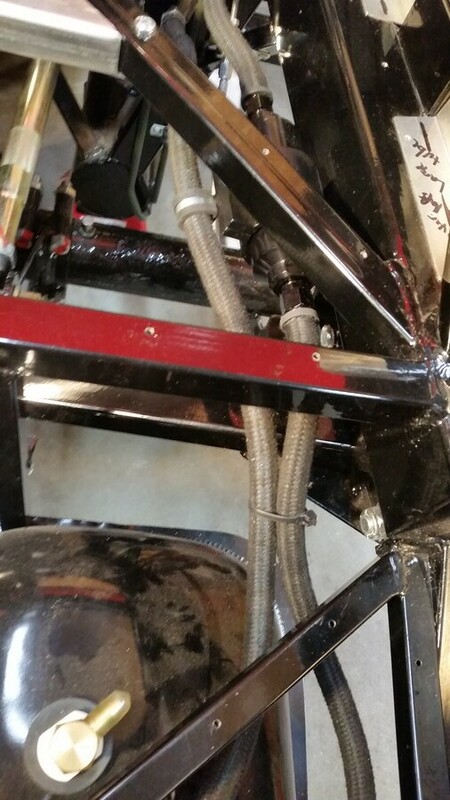 This is a shot of the hoses on their way to the filter and the hard lines. I attached a p-clamp to the filter bracket to route the return line thru. I used Russell adaptors (p/n: 640610) Click Here to go from the AN-6 on the flexible lines to the hard lines. I bought the wrong ones the first time, hence the reason I had an extra adaptors laying around. A lot of guys on here have mentioned it's two steps forward one step back a lot of times with these builds...well, that's just what I had with this portion of the build. I originally attached the hard lines to the frame with vinyl coated p-clamps. On a couple of the clamps the vinyl peeled off before I had them riveted to the frame. I wasn't thrilled about that, so I removed all the clamps and replaced them with p clamps with rubber sleeves. They turned out a lot nicer. I'm pretty happy with them now. I updated my pictures above to show the new rubber line p-clamps. Last edited by Yama-Bro; 01-15-2019 at 08:37 AM. Looks really good! Came out very nice and professional looking. Hey hey. Thanks for checking on me. I don't have any updates. LOL. I've been slacking for the last month and a half. It's been really cold here in Nebraska. My little garage heater can get the air temp down to a comfortable level after running for a few hours, but everything else is still cold (tools, floor, etc.). I just don't enjoy going out there when it's cold, so I decided to wait until it warms up. I guess I'm a fair weather builder. I'm sure it's not as bad as what you are used to LOL. I had plans to build my engine during February and March at work, but I've had a change in direction concerning the engine. It's going to delay my build quite a bit, but I think it'll be well worth it. To keep myself busy I've been remodeling my wife's kitchen, which is kinda payment for letting me get the car in the first place (time to pay the piper). I also got a screaming deal on a high end 1/24 scale slot car set, so the boys and I have been having fun with that. 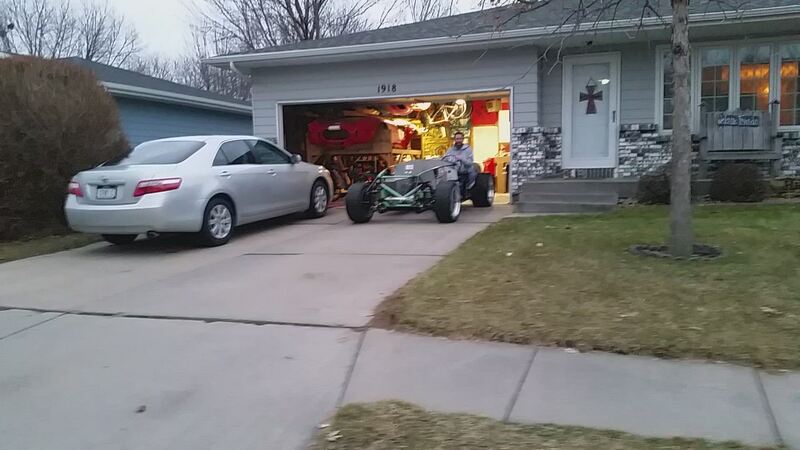 With all that being said, I am jonesin to get out and work on the car. "My wife's kitchen" !!! Lol, I love it! My shop definitly has a big heater and lots of installation! I also took the leap and my completion date at FF is March 30th. I'll be picking it up myself and then working on catching you!!! Probably good your giving the child labour a break anyways, sounds like good times! You aren't joking about them coming a long ways! When I was a kid, I remember playing with the analog set my Dad still had from when he was a kid. It was pretty basic and got boring after awhile. The one we got is a Carrera Digital 124 set. It has lane changing, big cars, wireless controllers, pit stops, adjustable brakes/throttle/fuel levels, allows several cars per track (even on the same lane), ghost cars, and lap timing. I even have an app that controls the whole thing from my phone. You can setup races and even simulate weather with it. LOL. I cast that from my phone to my projector and show the current race standings on the wall. It's really fun. I had a guys night at my house a few weeks back. Basically, a bunch of friends came over for adult beverages. When I told them about it, they were a little apprehensive about "playing" with slot cars at first, but once I showed them a lap with my vette drifting around corners and the lap tracking software, they were hooked. We raced for 3 hours. LOL. A couple of those guys are looking to get their own tracks. I'm planning to build my own custom slot car with a Cobra body next. Last edited by Yama-Bro; 02-27-2019 at 02:21 PM. Yeah, insulation really helps. LOL The the exterior walls and ceiling of my garage aren't insulated. So that doesn't make it any better. I need to do that someday too. Congrats on your order! I'll be taking hints from your build thread before I know it. Haha! Woohoo, I finally got back to working on the Cobra this weekend. It felt great to make some progress. I took a break because it was bone chilling cold here in Nebraska and we were giving the kitchen a facelift...and I may have been racing slot cars inside where it was warm . Well, the weather finally turned and the kitchen is almost done, so we're back at it. I recruited Cody for some brake bleeding. 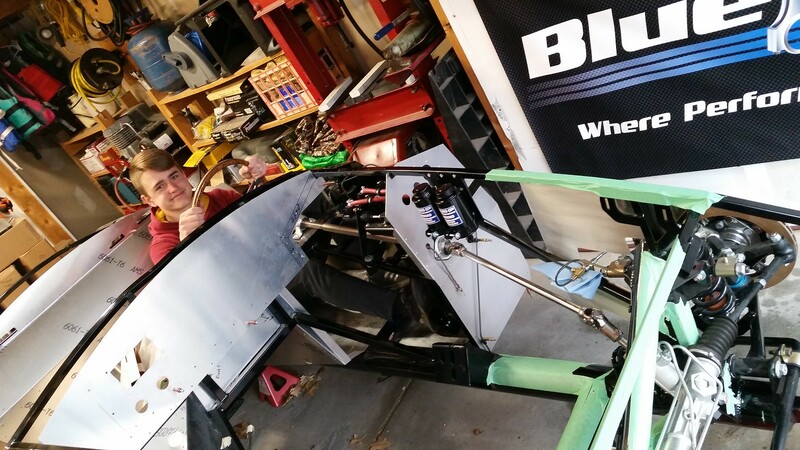 First we bench bled the master cylinders in the car. Next we bled the rear brakes then the front. Here's Cody doing the pumping. We had a sizable leak where the blue paper towel is, right above the steering linkage. I loosened and re tightened the fitting once and got the leak down to a minuscule seep. I'll work on this more in the coming days. Worst case, we'll need to redo the flare or possibly the whole tube. I decided to use Dot 3&4 brake fluid. 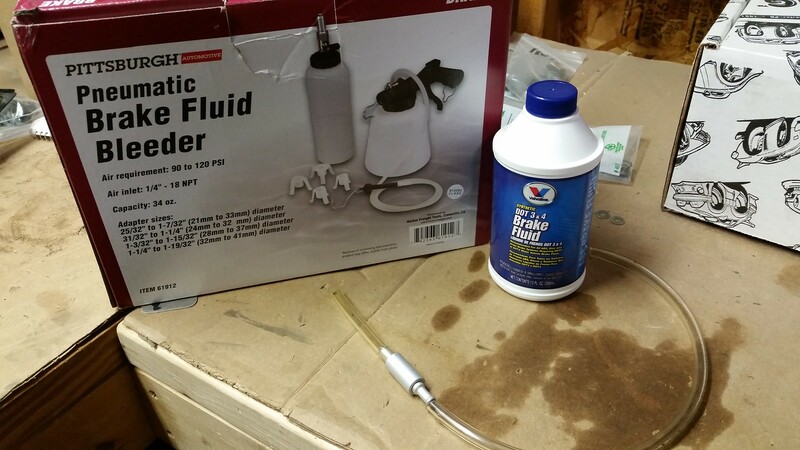 We tried using the harbor freight pneumatic bleeder, unfortunately, it doesn't seem to work. We went thru several cycles of my air compressor refilling before I gave up on it. Bummer. So we defaulted to the old school pumping of the brakes, which worked great. I used this little tool that I had from my ATV days (see the small silver cylinder in the picture). It attaches to the bleeder valve with clear hoses and only allows the fluid and air to flow one direction. It really helps keep the air out. After we did a couple stops in the garage, we sent it down the driveway for a brake check. They work! Click the picture to see the video. Last edited by Yama-Bro; 03-25-2019 at 10:51 AM. Hello sir, your braking skills are impressive! I am thinking about checking my brakes again, it feels bit spongy. Can you please elaborate on...."I used this little tool that I had from my ATV days (see the small silver cylinder in the picture). It attaches to the bleeder valve with clear hoses and only allows the fluid and air to flow one direction. It really helps keep the air out." Its a 1-way check valve. Thats how I bleed brakes by myself. Thanks! I haven't done brake bleeding on a car for a long long time. After I went back and read my post I realized my description of the tool was pretty vague. Sorry about that. LOL. Thanks for covering for me Boyd! Last edited by Yama-Bro; 03-25-2019 at 01:52 PM. I conquered my leak. I tried loosening and re-tightening several times. It didn't help. So I took off the whole line, cut off the leaky flare, and then re-flared the end. I put it back together. This weekend my friend Clint was over so I had him help me bleed them. There were no leaks. I guess that's the hazards of using a cheap flaring tool. In my mind, one leaky flare out of all of them we did isn't bad at all. 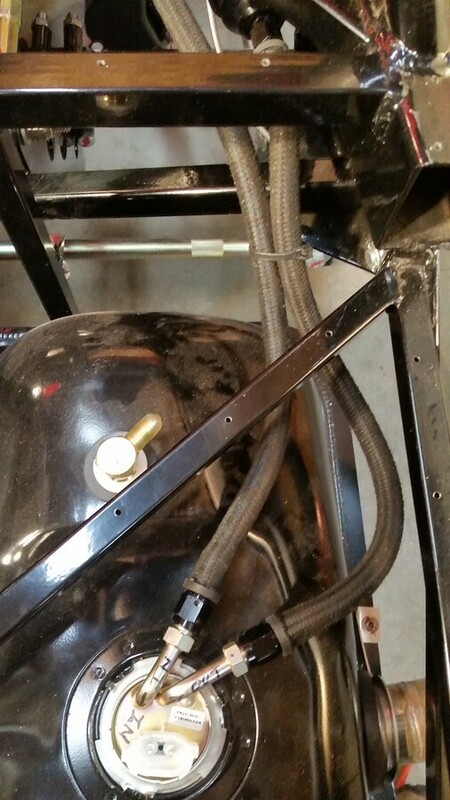 Next up...wiring harness. If everything goes as planned I'll have most of the day Friday to work on it. Good luck on the electrical. That part has slowed me down quite a bit. Let us know how it goes. Haha, it's just a stealth exhaust system . I did record another video where the kids were pushing while I was sitting in the car steering it down our street. I thought it would be funny to add some engine sounds to that one. Unfortunately, there wasn't enough daylight and the video quality didn't come out good. Maybe next time. Looking good, Frank! I sent you a PM.